H & H Aero, Inc. located in Erie, Pennsylvania has been supplying precision components for twenty seven years. 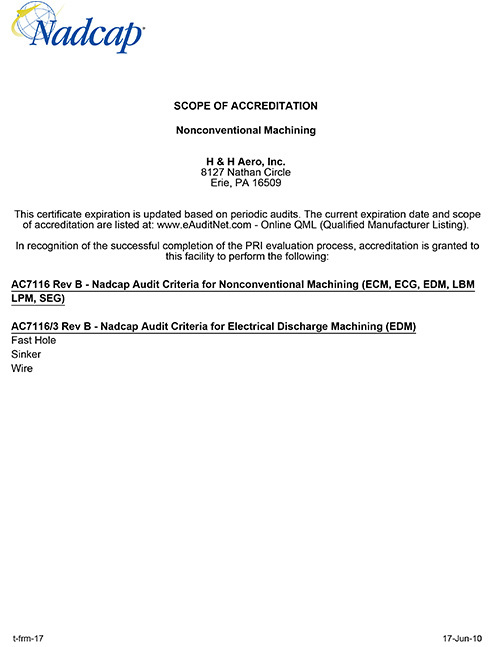 Originally established by Horoschuck brothers in 1984 and located in Albion, PA. H&H Aero developed into a leading supplier for tooling and component parts servicing Parker Hannifin aerospace division. Pyramid Industries, Inc. purchased H & H Aero, Inc. in 1997 and relocated to a 9,000 Sq, Ft. facility in Cranesville, PA. and continued to establish H & H Aero, Inc. as a leading supplier for turbine engine components. H & H Aero, Inc. operated as a department of Lamson and Session Plastic pipe business, resulting from the purchase of Pyramid Industries Inc. in 1999 until 2007. Thomas and Betts Co. purchased the Lamson and Sessions Co. in 2007 and realigned the business divisions divesting the Plastic pipe divisions. Mr. Michael Ray Morgan and the Boreflex industries investment group purchased the Lamson and Sessions Pipe division from Thomas and Betts in 2009 starting with H & H Aero, Inc. in December of 2008. Mr. Morgan recognized the additional opportunity for H & H Aero, Inc. development. Mr. Morgan established H&H Aero as a standalone entity, giving the company the flexibility needed to continue the rich history as a supplier of high technology turbine engine components. Mr. Morgan invested in experienced aerospace management staff, computer systems, engineering software, state of the art CNC machining and quality systems and equipment. This fore sight and investment has enabled H & H Aero, Inc. to expand into a new 57,000 sq. ft. facilities and expand its quality certifications to include ISO 9001 STD 2008, AS 9100 Rev B and NADCAP – Non conventional Machining. 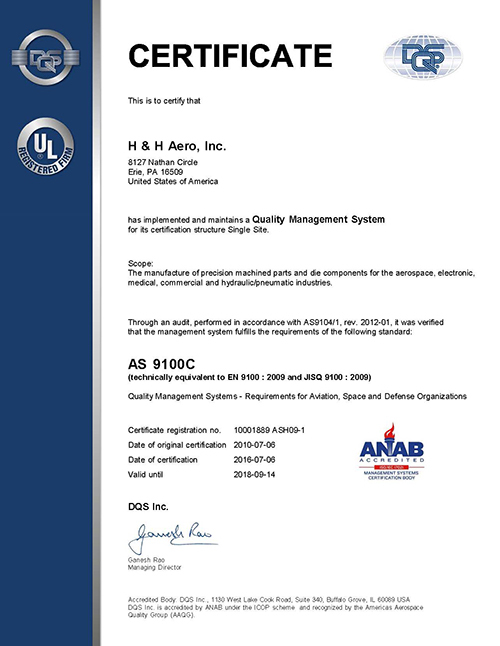 Today H & H Aero, Inc. has been honored with opportunity to be included in a select few of suppliers that participate in Parker Aerospace Part per Million quality programs and is recognized in the industry as a leading quality supplier in close tolerance component parts manufactured from High temperature aerospace materials. This recognition has positioned H&H Aero for growth into advanced technologies serving a larger aerospace customer base. 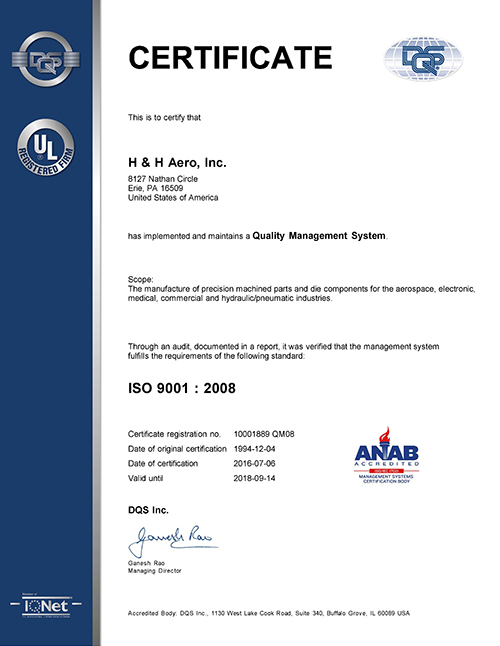 Mr. Morgan and The H & H Aero, Inc. team has positioned the company for growth through latest technologies and continuous improvement management.